I tried to drag May out for as long as possible, but ultimately I failed, as you can see. Despite my best efforts, June arrived. Alright, I'm starting over. I will try to make June last for at least three months. I took a little bike ride after the show. I swear, some drivers are idiots. I suppose some of us bicyclists can be assholes too, but I'm not one of them. You're going down a narrow road with no shoulder in a car. There's a bike in front of you and a car coming in the opposite direction. What do you do? Slow down and let the car pass, then go around the biker, giving him a little space? No, you just keep going at your normal speed and make everybody else adapt. No special theme today, just free-form radio for Cullowhee and the world. Of getting what you want. It isn't at all. In a badly-fitting suit on a cold, wet morning. 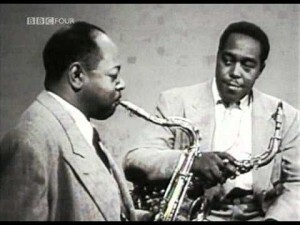 says that Parker's thin and somewhat squeaky tone improved after having met Sidney Bechet. There may be some truth to that. His tone does seem to improve in his later years. Speaking of Bechet, we listened to his "Petite fleur," a nice version by Harry Connick, Jr.'s band. I announced it as "Siboney," by mistake. Later I played "Siboney" and admitted my mistakes. I've made a few but have yet to have sand kicked in my face. Mary Ellen and Jim Dandy tie for the second week in a row on the cover contest. 1. What tune is Sly Dunbar doing and who had a hit with it? "Slipping into Darkness," War. Both MER and Dandy guessed "Get Up, Stand Up." 2. What's the tune that Neil Young is covering, and who had a hit with it. "Reason to Believe." I was thinking Rod Stewart, but I would accept The Carpenters or Tim Hardin (the author). 3. Who is covering "Hey Jude"? And who does the guitar solo? - Wilson Pickett / Duane Allman. 4. Whose tune is "Early Morning Rain" - Gordon Lightfoot. Catamount Community Radio, Sunday mornings 10-12 (East Coast) on Power 90.5.